Looking to Order Takeout in St. John’s? Are you in the mood for something different? Let India Gate Restaurant take you on a culinary exploration of Indian cuisine. With options for dine-in, delivery or takeout in St. John’s our food is made fresh to order, using the finest ingredients. Our traditional and authentic dishes are crafted with mouth-watering spices, fresh herbs, creamy sauces and velvety textures. We are a family owned restaurant that has served up Indian delicacies to our hungry patrons for more than 25 years. Enjoy expertly cooked lamb, tandoori chicken and popular naan bread, and all the diverse Indian flavours you crave. Give us a call today to place a takeout order or to inquire about our catering services! To learn more about what we offer, we encourage you to peruse our menu. Are you planning a family get-together or an office party? If so, sit back and allow India Gate Restaurant to prepare the food for your event. With a vast menu and items perfect for sharing, our traditional Indian cuisine will be sure to spice up your next event. We have experience catering private events of all sizes. Contact India Gate Restaurant to learn more about our catering services. 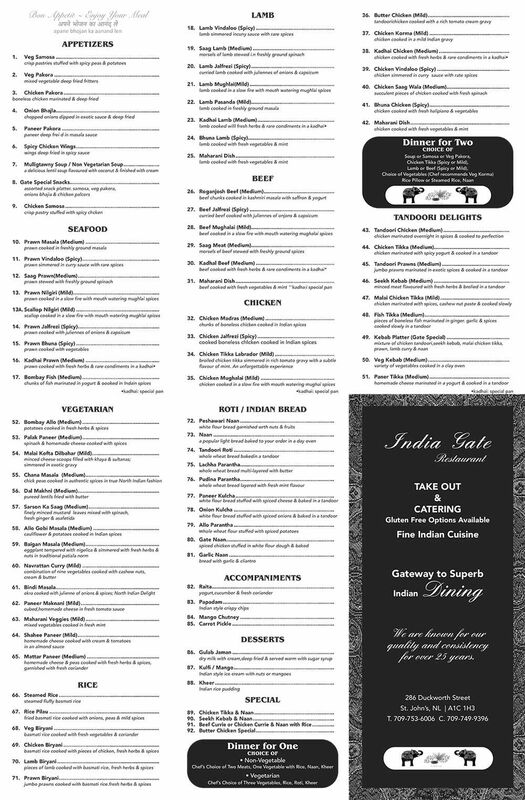 Keep a copy of the India Gate Restaurant menu handy for easy ordering. Click here to download our menu.